The secret confessions of a Parma ham maker – How to make prosciutto. Curing ham in a culinary art and it should not be taken lightly. To become a master Parma ham salter might take many years. Fabrizio of La Perla Parma ham factory in Langhirano says it might take up to 10 years to really master the ability to put the right amount of salt in the right places, he explained during one of our prosciutto tour in the area. According to the discipline of the Parma ham consortium the back legs of the animals must arrive quickly at the curing facility. In fact the freshly slaughtered meat has bacteria growing on it, the faster you start the production, the least salt you will need to use. Parma ham is famous for its delicate aroma, and surprisingly it is not salty at all. This is obtained by adding little salt, time and patience. But curing meat with little salt also increases your chances to fail. When the meat arrives in Langhirano is loaded on a machine that massage and salts the rind.. The difficult bit is to salt the exposed meat, and that it is done exclusively by hand. Below you can see the 3 fundamental points where the leg is salted precisely by the skill full hands of the master salter. 1) it is important that the meat is not covered in salt, but it is applied only in these critical points. 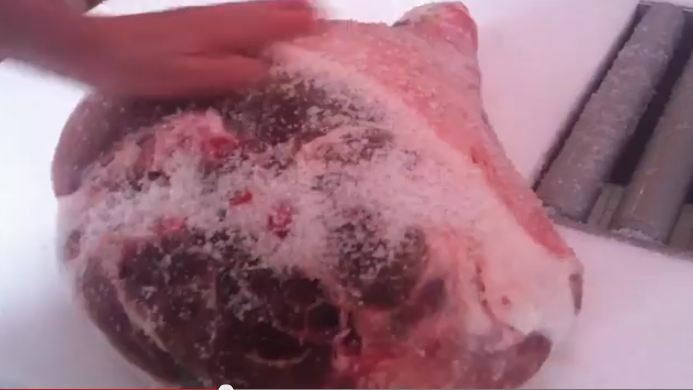 Firstly salt is applied on the femoral head as you can see in the picture above. These are points that if they are not salted correctly they will spoil easily. 2) Secondly he presses on the femoral artery, as pictured above, and he adds salt in the area that he created with his fingers. So this is an other critical point where the ham curer should take care of. 3) The 3rd and last part that has to be salted is the fatty part that it is between the meat and the rind of the pig. Therefore the master salter takes a handful of salt and smears it along the fatty line of the leg. Emilia Delizia organises Parma ham factories tours at small and artisan producers in the Parma province. If you are interested in ham curing techniques we will be glad to organise a detailed visit in the language of your preference. Previous Previous post: What is Gnocco Fritto?